The 2-Park 1-Day Park-to-Park Ticket entitles one (1) guest admission to BOTH Universal Studios Florida AND Universal’s Islands of Adventure theme parks on any one (1) calendar day corresponding to its season. A calendar of the seasonal dates can be found at universalticketcalendar.com. The ticket will expire in full on the expiration date printed on ticket. This Ticket has NO BLACKOUT DATES. The 2-Park 1-Day Park-to-Park Ticket entitles one (1) guest admission to BOTH Universal Studios Florida AND Universal’s Islands of Adventure theme parks on any one (1) calendar day corresponding to its season. A calendar of the seasonal dates can be found at universalticketcalendar.com. The ticket will expire in full on the expiration date printed on ticket. 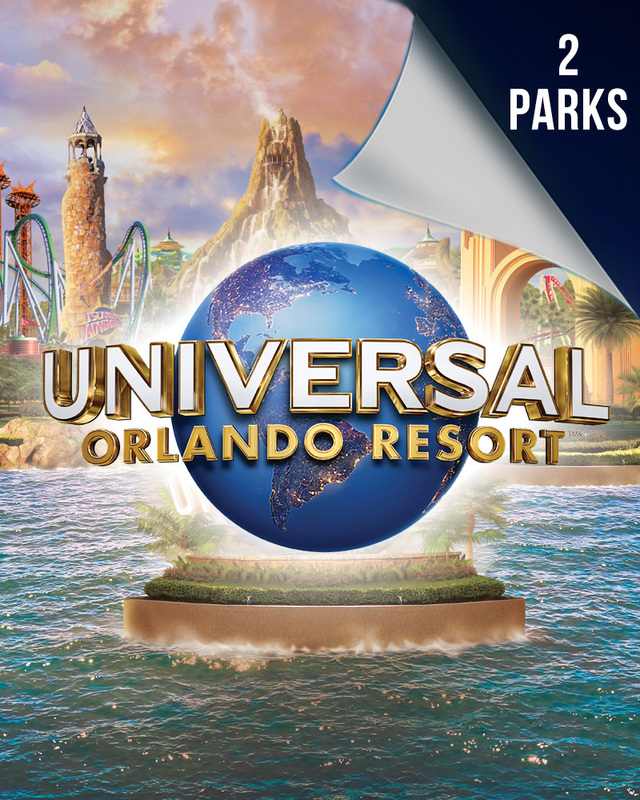 The 2019 2-Park 5-Day Park-to-Park Promo Ticket (5 Days for the price of 2) entitles one (1) guest admission to BOTH Universal Studios Florida™ AND Universal’s Islands of Adventure™ theme parks on the same day. Ticket is valid for any five (5) calendar days during a seven (7) consecutive calendar day period which includes the first day any portion of the ticket is used. This ticket also includes seven (7) consecutive calendar days of admission to select live entertainment venues of Universal CityWalk™ which commences and includes the first day any portion of the ticket is used. To receive full benefit of the ticket entitlements, first use of this ticket must be on or before December 16, 2019. All ticket usage must be completed on or before December 20, 2019 when the ticket will expire in full. BLOCKOUT DATES July 1 through and including July 31, 2019 will apply to this ticket. Unused days will be forfeited. This ticket will be sold only within the U.S. and Canada between March 15, 2019 and June 12, 2019. The 2019 2-Park 5-Day Base Promo Ticket (5 Days for the price of 2) entitles one (1) guest admission to EITHER Universal Studios Florida™ OR Universal’s Islands of Adventure™ per day. Ticket is valid for any five (5) calendar days during a seven (7) consecutive calendar day period which includes the first day any portion of the ticket is used. This ticket also includes seven (7) consecutive calendar days of admission to select live entertainment venues of Universal CityWalk™ which commences and includes the first day any portion of the ticket is used. To receive full benefit of the ticket entitlements, first use of this ticket must be on or before December 16, 2019. All ticket usage must be completed on or before December 20, 2019 when the ticket will expire in full. BLOCKOUT DATES July 1 through and including July 31, 2019 will apply to this ticket. Unused days will be forfeited. This ticket will be sold only within the U.S. and Canada between March 15, 2019 and June 12, 2019. The 2-Park 2-Day Park-to-Park Ticket entitles one (1) guest admission to BOTH Universal Studios Florida AND Universal’s Islands of Adventure theme parks on the same day. Ticket is valid for any two (2) calendar days during a seven (7) consecutive calendar day period which includes the first day any portion of the ticket is used. This ticket also includes seven (7) consecutive calendar days of admission to select live entertainment venues of Universal CityWalk which commences and includes the first day any portion of the ticket is used. The ticket will expire in full on the expiration date printed on ticket. Unused days shall be forfeited NO BLACKOUT DATES Please note: A 3-Park ticket is required to visit Volcano Bay. The 2-Park 5-Day Base Ticket entitles one (1) guest admission to EITHER Universal Studios Florida OR Universal’s Islands of Adventure per day. Ticket is valid for any five (5) calendar days during a seven (7) consecutive calendar day period which includes the first day any portion of the ticket is used. This ticket also includes seven (7) consecutive calendar days of admission to select live entertainment venues of Universal CityWalk which commences and includes the first day any portion of the ticket is used. The ticket will expire in full on the expiration date printed on ticket . Unused days shall be forfeited. NO BLACKOUT DATES Please note: A 3-Park ticket is required to visit Volcano Bay.